Get the complete guide to the rules of fundraising with this bundle pack. The Rules of Fundraising and More Rules of Fundraising combine to include 70 rules that experienced fundraisers know, gleaned from years of assisting organizations around the country. These proven rules can be immediately applied at your organization to boost results so order today! 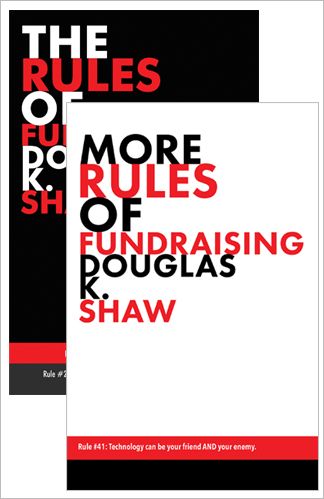 Douglas Shaw has been working in the field of direct response fundraising for over 30 years. During this time, he found it necessary to gather wisdom from making mistakes. He decided he could be a help to board members of nonprofits by giving them a guidebook of best practices, to CEO’s an insight into the complex world of development, and to the development officer a set of rules that can guide them into the best practices of their craft without having to make all the mistakes that he and his colleagues have endured throughout their decades of service. 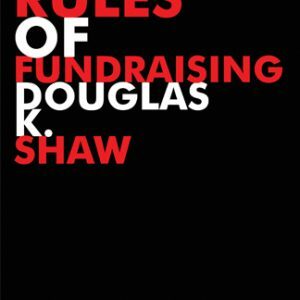 The Rules of Fundraising emanate from Shaw’s own personal journey of being born into dire poverty to working with presidents and celebrities, all for the good of fulfilling the missions of the hundreds of not-for-profit organizations. 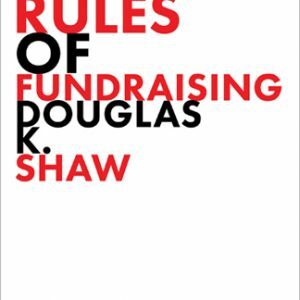 Shaw’s commitment is to open the book on direct response fundraising to any and all who want to learn to the fine art of fundraising by understanding the basic “rules” or tenets that exist and must be followed in order to be involved with a successful fundraising program. Nothing is held back, no secrets are reserved for higher paying customers. If followed, these rules will revolutionize any organization’s development program.